Why is it that the only time you turn your back for something, like a must something, answering the phone, bathroom break, switching the laundry, doorbell, important things of life; why is it at these small moments my children choose to put their escape plan into speed mode and get into trouble? I mean honestly they must be planning and planning and then holding that thought for the precise moment mom turns her back, not on the children, but for such as those things of life. My little curly cue is the planner and the expediter, of such plans as these. I of course hid the bag of dum-dum's but I have been figured out again, because all the things I seem to hide, are the ones that get found, imagine that. Yes, Presley and all her sweetness found my suckers, and by the time I returned from my "important" thing, which was not long, she had tested about twelve suckers, most of them stuck to the floor now. 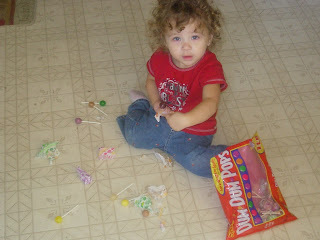 I couldn't help but laugh as I watched her taste one, throw it on the floor and dig for another. I guess she just couldn't decide which flavor she liked, and thanks to the manufacturer of the super sticky Dum-Dum, she had MANY to taste, just so many flavors. Of course she was a super sticky mess, and required a bath. And after the bath when I was adding one more thing to my list of tasks for the day, while I was scrubbing the floor, by hand, because the mop couldn't get the massive circle of stick off, I began to realize why they call them Dum-Dums. Not for just a unique name, but so importantly called that for the mom that put them within child's reach. DUM-DUM. 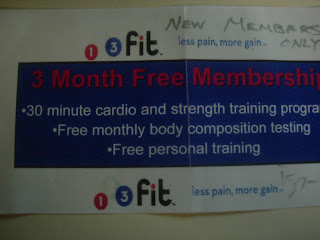 Also, for all you fitness fanatics out there, my dear husband bought this membership at the college on a silent auction. He payed forty dollars for it. It is a FREE 3 month membership to 123 fit. It includes personal trainer. For new members only. I would soooo love to use this, but my husband/student is never home, and when he is, he has to study. I cannot use it during the day because they don't have a daycare. And after I put the kids down to bed, I'm tired and one more trip into town is a waste of gas for me way out here in the country. So sadly, I am looking for someone who would like to purchase this pass. forty dollars is a great deal for 3 months, and no membership fee. If anyone is interested, let me know. Happy Exercising! I've often wondered about the name for the suckers, and just came to the conclusion that they were named for the people who buy them, because only a Dum-Dum would buy sticky messes to give their children! Thanks for my hair yesterday! 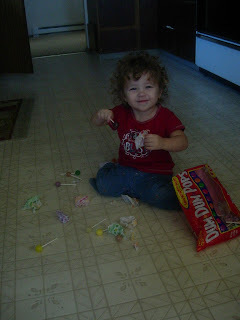 Bea loves Dum-dums too. If she sees the kids with one she won't stop until she gets her own.